By: Robert H. Sheinberg, D.P.M., D.A.B.F.A.S., F.A.C.F.A.S. What is arthritis? Arthritis is a degenerative process that may take place in any joint in the body. Cartilage which allows the joint to move smoothly starts to wear down. Bone spurring and bone cysts may occur as the joint wears abnormally. The joint starts to move out of its normal position creating pain with movement. A loss of joint movement also follows the arthritic process. 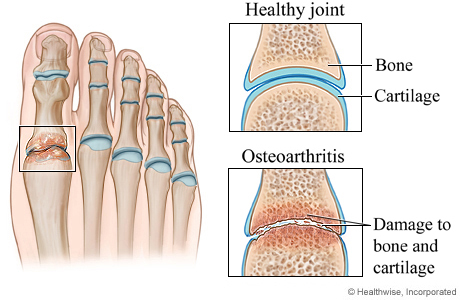 What causes arthritis? Most often arthritis is caused from an injury to the joint. The injury may occur as a child and it may manifest itself later in life. A bad injury to a bone or joint (fracture) may start the development of arthritis almost immediately after the injury. Arthritis is very common when a bone fractures into the joint. Malpositioning of the joint will cause abnormal wear and tear. It may also be seen in people who are excessively flatfooted, knock-kneed or bowlegged. It is also very common in people with bunions. Will the arthritis get worse over time? In almost all cases arthritis in any joint will worsen. The joint will wear abnormally causing pain, limited motion of the joint, bone spurring and swelling around the joint. The joint will become excessively stiff causing pain with many activities. Difficulty with certain shoes may also be present. Will medication help to lessen the pain and joint deformity? Oral medication will help to diminish some discomfort, but it will not change the degenerative process, which takes place slowly over time. Will physical therapy be of any benefit? Physical therapy will help retain some movement in the joint and keep swelling to a minimum. It may also help to improve muscle strength. Over the long term it will be of limited benefit as the degenerative process will continue to take place. Can surgery be of benefit if the arthritis is found early? Many procedures can be performed to assist in treating the degenerative process if found early. After a thorough history and physical examination x-rays are taken to assess the degree of joint damage. Occasionally if the damage is mild an arthroscopic or small open procedure may be necessary to remove abnormal bone and soft tissue. Cartilage that is lifted away from the bone is removed to allow the joint to function more normally. If a joint is out of position removing bone spurs and soft tissue may be of limited benefit. In this case the bones may need to be repositioned to allow more normal joint alignment. Can anything be done if the arthritis is severe? In some cases the arthritis is severe and joint replacement or joint fusions may be necessary. Joint replacements are an excellent option and may be necessary in older, more sedentary patients. Fusing the joint that is arthritic and not allowing it to move any longer is also an excellent approach to the treatment of arthritis. This eliminates any painful movement allowing a return to work and activities of daily living with minimal modifications. Some joints can be fused and still allow an athlete to resume professional sports. Will fusing the joint cause any long-term problems? Joints that are fused will be pain-free. Other joints adjacent to the fused joint will need to work a little bit harder and in most cases remain asymptomatic, especially if they are healthy at the time of the surgery. Will orthotics be of any benefit? Orthotics will assist in maintaining normal joint position. Support of the foot and placement of the foot in better anatomical position may redistribute stress more evenly in the foot and ankle region. This may help to lessen pain and possibly delay the need for surgery. They provide great benefits in people with big toe joint (turf toe, bunions) problems. Orthotics are also very useful in patients who are flatfooted, knock-kneed, bowlegged and in those with lower back pain.